At Stratford Library's Indie Author Day. Been there, done that, got the T-shirt! 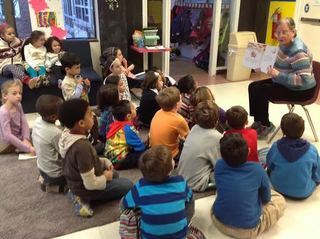 I had a wonderful time reading my Hanukkah book to the families in Marblehead, MA. I enjoyed reading my book and meeting some old friends. It was fun meeting Christine Ieronimo, Millie Wilson Ostroski, and Patricia Clark Smith at the Avon Library Local Authors Fest. She did a lovely job coloring the dreidel from my book! I certainly was busy reading and signing copies of my book, The Dreidel That Wouldn't Spin: A Toyshop Tale of Hanukkah, at various author events in December, 2014! -- and of course, my own Stratford Library! Lucretia and I enjoyed speaking to other librarians at the NELA (New England Library Association) Annual Conference in Boxborough, MA on Tuesday October 21. We did a presentation based on our book, Bringing Classes Into the Public Library, as part of a panel on school and public library cooperation. We met several librarians and shared ideas for library programs. Thanks to everyone who came by and talked to us! I was a guest author at the Norwich Free Academy Book Expo, held in conjunction with Norwich Author’s Day, to promote The Dreidel That Wouldn't Spin: A Toyshop Tale of Hanukkah. I spoke on a panel with Wally Lamb, Esther Friesner, and other authors. Great company! Thursday, May 29, 2014 - During BookExpo America I went to dinner with some Wisdom Tales publishers and authors. Here I am with Jacqueline Jules and her husband, Mary-Kathryne Steele, Alexis York Lumbard, and Joseph Fitzgerald. I presented a program with Gayle Byrne, Children's Librarian at the Killingworth Library, at the Annual CLA Conference. I spoke about how I came to publish my professional books as well as my picture books. Gayle talked about her picture books, Sometimes It’s Grandmas And Grandpas Not Mommies And Daddies, and Sometimes One Is Just Right.